Born in the Dominican Republic, trained in Europe, and coming into his own in the United States, Oscar de la Renta is one of THE modern masters of fashion design. Upon hearing of his passing yesterday evening [October 20th], I was overcome with emotion, and in this time, I gave myself a moment to reflect. I first become familiar with the name “Oscar de la Renta” as a young girl; my grandma wore his namesake perfume, and always had it sitting front and center on her dressing table. At that time, I was unaware of the fact that he was an incredible fashion designer, but I knew from the presentation of his product that he catered toward a certain type of woman, and that that woman embodied grace, and effortless style. Over the years, my interest in fashion grew, and I always tried my best to make my ideas a reality with the help of my mother, whom aside from being a schoolteacher, was a seamstress. Together, we made all my dresses for special occasions, and for whatever reason, I was perfectly in-tune to what a “timeless” piece was to look like. I wanted to look like all the beautiful women who wore Oscar de la Renta, and my other favorite designer, Carolina Herrera. I continued to read and research his career as a designer, and was determined to meet him. 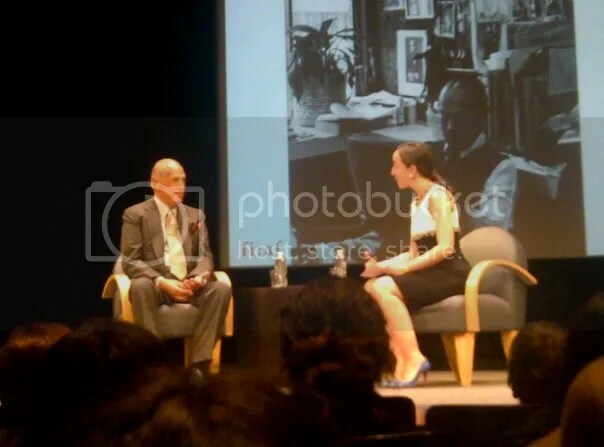 On one lucky day in April 2011, about a week before I started this blog, I attended the Fashion Talks series at FIAF, where Oscar de la Renta was the distinguished speaker. He discussed his uncommon path in choosing fashion design, leaving his native Dominican Republic to study art in Europe, and the evolution of his career, working as an apprentice for Balenciaga, transitioning to assisting Elizabeth Arden, to Balmain, and eventually, starting his eponymous label. One thing that rang true in hearing him speak, and viewing his collections is that clothing for women should be wearable. At this time, those words were a wake-up call for me, having learned design in college and feeling like an outcast because my peers designed conceptual collections while mine were actually wearable. I was reassured that I was on the right path. Upon the closing of his talk, my two co-workers who attended with me and I were determined to meet the man himself. 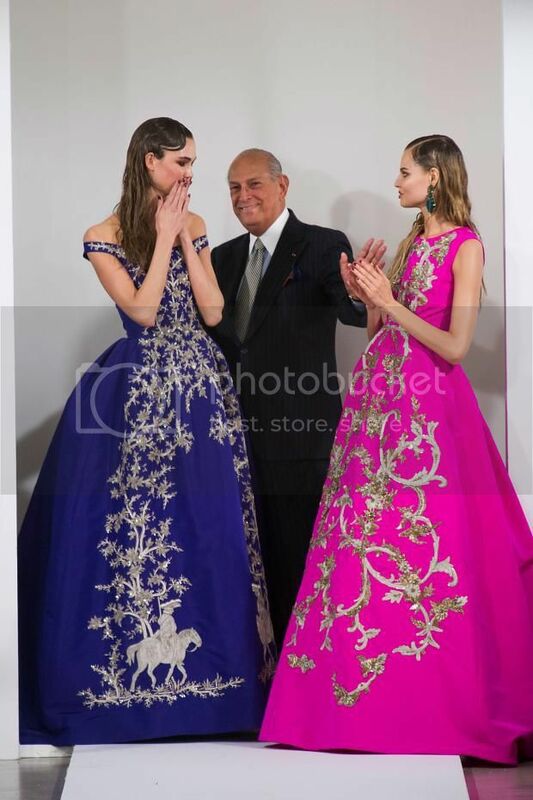 We nuzzled our way backstage upon his exit and were able to shake hands with de la Renta, and confess our admiration for him as a person and a designer. He was so poised and gracious, treating every person like an old friend, exchanging hugs and kisses and well wishes to emerging designers. He really showed me that it was more important to be gracious, than the cold, bitchy diva we are used to seeing in the fashion world. To be someone relatable that could create beautiful things; that is what he showed me, and that is what I try to uphold in my everyday life. 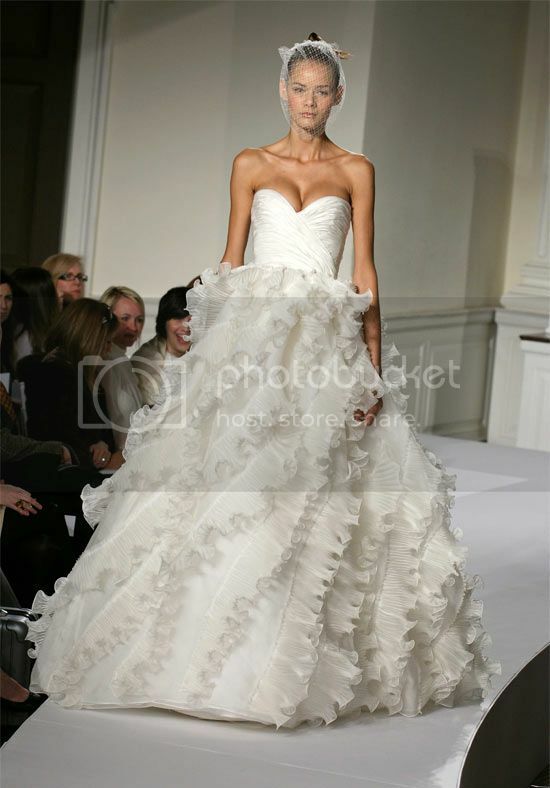 Like many women, I often create the picture in my mind of what I believe my wedding to be like (yes, quite girly I know) and I always picture myself in one of his gowns, specifically the dress below. Oscar taught me to not be afraid to use color, and to not be afraid to be simple; to be able to retract to embody luxury. He taught me that consistency is key, and that the goal is to create a piece that will stand the test of time. To create something that is timeless; that is what Oscar has done. May his soul rest in peace, and may his influence live on forever.